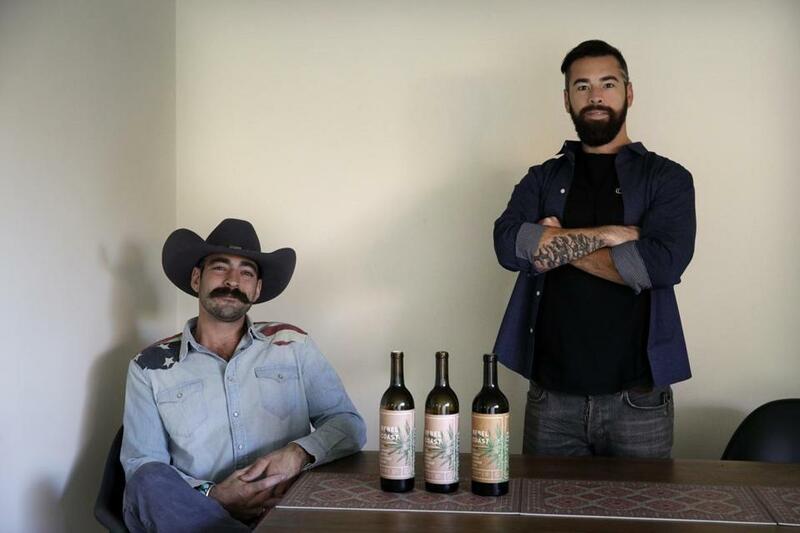 Alex Howe (right), and Chip Forsythe, the cofounders of Rebel Coast, with their cannabis-infused wine in Los Angeles. Each bottle contains 16 milligrams of THC. SAN DIEGO — The sauvignon blanc boasts brassy, citrus notes, but with one whiff, it’s apparent this is no normal Sonoma County wine. It’s infused with THC, the psychoactive ingredient in marijuana that provides the high. Move over, pot brownies. The world’s largest legal recreational marijuana market kicks off Monday in California, and the trendsetting state is set to ignite the cannabis culinary scene. Chefs and investors have been teaming up to offer an eye-boggling array of cannabis-infused food and beverages, weed-pairing supper clubs, and other extravagant pot-to-plate events in preparation for legalization come Jan. 1. Legal pot in states like Oregon, Washington, and Colorado and California’s longstanding medical marijuana market already spurred a cannabis-foodie movement with everything from olive oil to heirloom tomato bisques infused with the drug. Cannabis-laced dinners with celebrity chefs at private parties have flourished across Los Angeles, San Francisco, and San Diego in recent years, but a medical marijuana card was required to attend. With that requirement gone, the edibles market is expected to boom, though manufacturers face a host of regulations, and doctors fear the products could increase emergency room visits and entice youth. Marijuana industry analysts predict edibles for the recreational marijuana market will top $100 million in sales in 2018. ‘‘Californian’s culinary expertise is far more refined from college kids making pot brownies in a dorm,’’ said John Kagia of Frontier Data, a cannabis market research firm. Expect a slew of vegan and gluten-free choices and low-dose snacks from trail mixes to chocolates. And they may well be served at a gym or Pilates studio. That includes ethnic options in a state with the largest immigrant population in the United States. But Espiritu worries regulations could make certain aspects of the culinary experience accessible only to the elite in places like Beverly Hills. Kitchens for those making edibles to sell must be licensed. And organizers must pay $5,000 a year for a license to host up to 10 events, and depending on the size, they may be required to hold them at a fairground. Cities can pose additional fees and ban an event altogether. Regulations prohibit manufacturers from producing cannabis products for retail sale that include perishable items that could pose a health risk, such as dairy, seafood, fresh meat, or food or beverages appealing to children. It’s still unclear if those rules would apply to a chef-hosted dinner or cooking class that people have paid for. Edible products must be produced in serving sizes with no more than 10 milligrams of THC and no more than 100 milligrams of THC for the total package. Drug policy expert and Stanford Law School professor Robert J. MacCoun said the regulations are too lax. Edibles already being sold in the medical marijuana industry vary widely in their potency, so people get more stoned than they planned and can end up in emergency rooms. The bright packages appeal to children, who often are too young to read warning labels, MacCoun said. He thinks edibles should be restricted to plain brown or white packaging. ‘‘Everyone sees this as a kind of new gold rush in the way that it will make a lot of money, but I think we need to be more careful about how this rolls out,’’ he said. Many see California’s recreational marijuana business mirroring its wine industry, with people seeking weed pairings, cannabis farm tours, and products made from organic, local plants. Rebel Coast Winery’s THC-infused sauvignon blanc is made from Sonoma County grapes, but the alcohol is removed in compliance with regulations that prohibit mixing pot with alcohol. It smells like marijuana, meeting another requirement that it not be confused with a food or beverage that does not contain pot. Founder Alex Howe is planning high-end dinner parties in Los Angeles in early 2018 to debut the $59.99 bottle of wine. Each bottle contains 16 milligrams of THC, and the company says on average, people feel the effects in under 15 minutes. ‘‘We really wanted to mimic that ritual of opening a bottle of wine at dinner, or at a party with friends or while watching a movie, which is something so familiar to people, especially in California,’’ he said.